I got a heads up that the latest issue of Fortean Times was publishing a new story on a Loch Ness Monster photograph. It was taken by Jonathan Bright who was on a mystery tour of Britain back in November 2011. If you want the full story, get the latest issue of Fortean Times (number 308). What do readers make of it? Is it a ridged back or a head-neck with a mane like appearance in true Water Horse fashion? On the other hand, sceptics may think it is just a wave, debris or a hoax. I will put up my analysis in due course. All I will say just now is that if it is a picture of the Loch Ness Monster, it is one of the best (and the first taken in infra-red). The British Pathe website contains a wealth of material on news events covered by the famous media company from decades past. Naturally, the Loch Ness Monster features in a few of them. I found these ones on a search of their archive. Leslie Holmes sings "The Monster of Loch Ness" from 1934. The Loch Ness Monster and 1933. 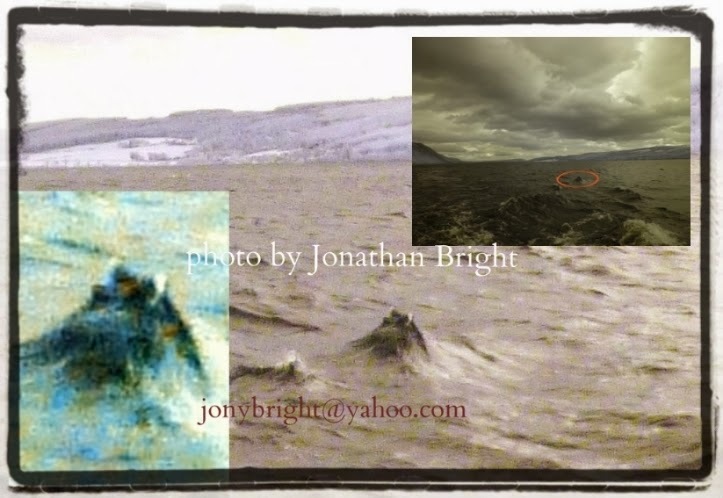 This fascinating clip mentions the emergence of Nessie but also gives the historical context - what was happening in the world when a strange monster in a remote Scottish loch turned up? This clip appeared on the Loch Ness Monster Debate Facebook page, but I include it for completeness. It details Dan Taylor's Viperfish and the Sherlock Holmes model that sunk.